What does your money really have to do to bring you peace of mind? The answers lie in asking the right questions, so what are the right questions that every investor needs to answer to gain true peace of mind? 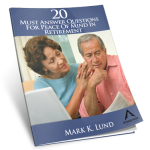 They are contained in our free report we have titled The 20 Must-Answer Questions for Peace of Mind In Retirement. The bad news is that few investors can successfully answer “yes” to all, or even a majority of these questions the first time they see or hear them. The good news is that with the support of a coach, you can find the answers to each and every one. The answers to these questions are critical for your success and they will be unique to you. No two investors will have the exact same answers-they are yours and yours alone.